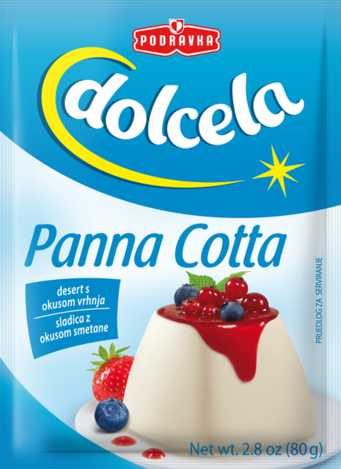 The delicious Italian milk recipe - panna cotta, "cooked cream" or whipped cream pudding, once demanded a toilsome preparation - but thanks to Dolcela today it is a fast and simple choice for all sweet tooth gourmets. The main components of this product are carbohydrates, and its natural thickener is the insoluble dietary fiber carrageenan. To get a perfect pleasure serve Panna cotta with fresh fruit, especially sour red fruit (wild strawberries, blueberries, blackberries, raspberries...), which are rich in antioxitants that help preserve our health. Preparation: Empty the bag contents in 400 ml of boiling milk, stirring with a whisk cook for 1 minute. Pour the cream in moistened bowls and cool. Before serving, you can decorate with fruits, toppings, or compotes. Ingredients: sugar, hydrogenated vegetable fat (coconut), corn starch, glucose syrup, skimmed milk powder, milk proteins, thickener (carrageenan), emulsifier (E 472b), flavor. Storage: Keep in a cool and dry place!